In quantum physics the vacuum is not empty, but rather steeped in tiny fluctuations of the electromagnetic field. Until recently it was impossible to study those vacuum fluctuations directly. Researchers at ETH Zurich have developed a method that allows them to characterize the fluctuations in detail. Emptiness is not really empty – not according to the laws of quantum physics, at any rate. The vacuum, in which classically there is supposed to be literally “nothing”, teems with so-called vacuum fluctuations according to quantum mechanics. Those are small excursions, for instance of an electromagnetic filed, that average out to zero over time but can deviate from it for a brief moment. Jérôme Faist, professor at the Institute for Quantum Electronics at ETH in Zurich, and his collaborators have now succeeded in characterizing those vacuum fluctuations directly for the first time. Faist and his colleagues, therefore, decided to measure the electric field of the fluctuations directly. To that end, they used a detector based on the so-called electro-optic effect. The detector consists of a crystal in which the polarisation (the direction of oscillation, that is) of a light wave can be rotated by an electric field – for instance by the electric field of the vacuum fluctuations. In this way, that electric field leaves a visible mark in the shape of a modified polarization direction of the light wave. Two very short laser pulses (lasting for a fraction of a thousandth of a billionth of a second) are now sent through the crystal in two different points and at slightly different times, and afterwards their polarisations are measured. From those measurements, the spatial and temporal correlations between the instantaneous electric fields in the crystal can finally be calculated. To make sure that the electric fields thus measured actually arise from the vacuum fluctuations and not from the thermal black body radiation, the researchers cooled the entire measurement apparatus down to minus 269 degrees centigrade. At such low temperatures, essentially no photons of the thermal radiation remain inside the apparatus, so that whatever fluctuations of the electric field are left over must come from the vacuum. “Still, the measured signal is absolutely tiny”, ETH-professor Faist admits, “and we really had to max out our experimental capabilities of measuring very small fields.” According Faist, another challenge is that the frequencies of the electromagnetic fluctuations measured using the electro-optic detector lie in the terahertz range, that is, around a few thousand billion oscillations per second. 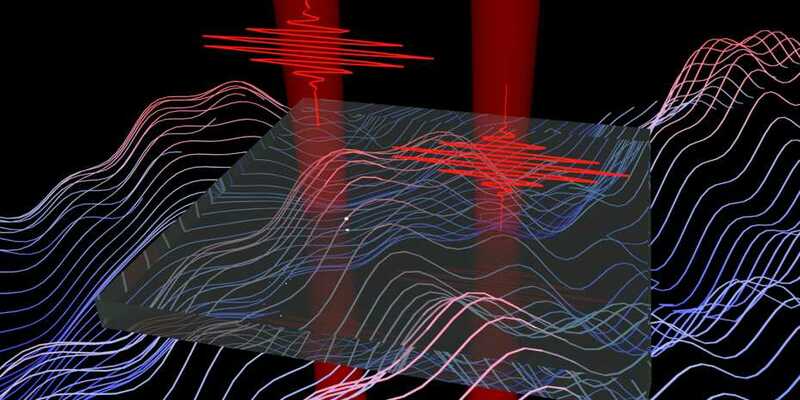 In their experiment, the scientists at ETH still managed to measure quantum fields with a resolution that is below an oscillation cycle of light in both time and space.